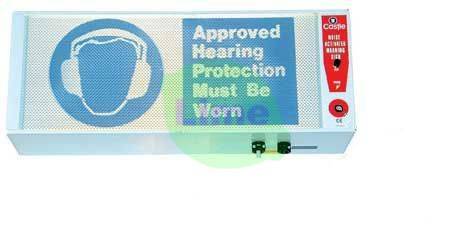 The GA902A Warning Sign Slave Units allow a repeated version of the noise activated sign message to increase visibility. Using this function along with the ability to link masters together, it is possible to build up systems to suit almost any configuration of workplace and warning requirement. Being of rugged construction, the GA902A is suitable for most industrial situations. It is also available in Stainless Steel for the food and pharmaceutical industries. Noise warning text is generally supplied to EC requirements, but alternative graphic and languages are available to order. The GA902A Noise Warning Sign Slave is powered from the master. Two masters can also be linked to work together. These features can greatly extend the scope of your system whilst keeping the number of units to a minimum.